Numerours TCUs are developing across the SLGT/MDT risk area over France and Benelux. Latest sfc data show significantly backing surface winds across the region with southeasterles at 10-20 kt present. A strongly sheared environment with 40-60 kt DLS and SREH3 up to 300-400 m2/s2 overlaps with 700-1500 SBCAPE and moderately strong QG forcing. 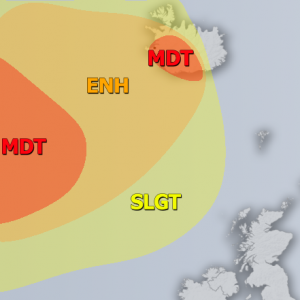 Conditions are favourable for development of numerous supercell thunderstorms with threats for strong rainfall, strong wind gusts and marginally large hail. Particularly over S-CNTRL France and to a somewhat lesser extent N-CNTRL France strong low level shear (20-35 kt) and SREH1 in excess of 200 m2/s2 coupled with LCLs below 1000 m and and steep LL lapse rates produce an environment favourable for tornadogenesis and tornadoes are well possible.